Share interesting information or links related to portable apps here. https://tagstoo.sourceforge.io/ wrote: [Tagstoo is a] Free utility to tag files and folders, because tagging must be funny. 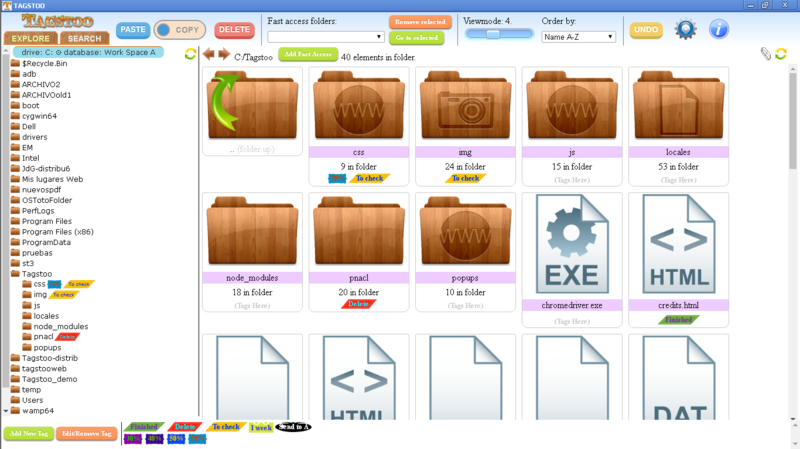 https://sourceforge.net/projects/tagstoo/ wrote: With this application you can tag folders and files; create tags with various shapes and colours for easier classification and by drag and dropping them, tag a file, a folder or all the content of a folder. Precise search possibilities, with various input fields, allowing to add all the necessary tags that you want. Anyone know the system requirements for this program? Has 32-bit and 64-bit versions, but doesn't seem to work under Windows XP. Website documentation currently not that much help in this regard. Very intresting. I like the way this has some file manager components, which makes a lot of sense. I'm not thrilled with the interface, which feels a little odd (cyan text on bright red background? ), but I really like where it's going. I hope they put out a more minimal skin of some sort. Also, why did you put this in Resources? Not expecting it to be portable? Tagstoo v1.10.4 released (changelog is online but not addressable; see below). - Simply added url to project webpage in info about this. - An important bug of invalid exported tag data when tag was edited solved. - Now imageviewer can be closed by right mousebutton. - Updated to latest version of NW.JS. - It can be activated and selected a time to auto-change image on imageviewer. - Fixed a bug while reordering tags at bottom. - Updated to last version of NW.JS. - Updated to latest version on NW.JS. - Linux version is now also available. - Added input for a tag that must not been in search results. - Fixed bug in copy-cut switch when clicked its inner circle. - Improved search options. Integrated image-viewer now true Fullscreen. - Optimized velocity for folders content visualization and search results visualization. - Some code changes for best performance. Updated to latest version of NW.JS. - MacOS version is now also available. - Changed the method that load available database list, version advances one tenth to avoid confusion. - Fixed bugs in Import/Export options. - When undo add tag to an archive in the search results, view is correctly refreshed. - Removed an unintentional tooltip that appear when mouse over the delete button. - Various fixes in the visual actualization when tagging in the search results. - Added possibility to copy, move, rename or delete archives and folders from the searched results. - Some shortcut keys added (ctrl-c,ctrl-x,ctrl-v,del,ctrl-a). - Added possibility to choose between color and 'grayscale' mode of the interface. - Added Tips in popup when program launch. Updated to latest version of NW.JS. - Fixed bug when listing in order "name Z-A" in searcher. - Now is not necessary to apply changes in options. - Fix: When import data from file to the currently using database, in options, the program now automatically reloads it. - In the options, if the drive associated to currently in use database, change, program will reload it when popup is closed. - More robust adjustable columns width. - Fixed error when press 'supr' key while editing name. Fixed error while copying from search in a viewmode different than 1. - Some other minor fixes and improvements. - Select folder windows, launched from searcher, both to select search folder and to select destination folder are completely rewritten to best fit the program. - A bug that appear in the previous version, when ordering search results, is fixed. - Added option to bypass program question about tagging subelements when tagging folders. - Solved bugs with filesystem operations when working on external drives. - Much faster File/Folder operations because program not need to auto-refresh folder view. - Application's Icon and Logo changed. Updated to latest version of NW.JS. - Important bugs in the visual refresh when deleting elements that appear in previous version fixed. - A bug that appear sometime that causes to fail to add tag to searched results on viewmodes 2-9 is fixed. - Bug with undo, on searcher after tagging element, solved. - Added option to both list search results in a printable-friendly form and also names of searched folders/files as plain text that can be saved to use elsewhere. - Faster folder content loading times as images and videos are only loaded when are visible on scrolling. - Solved bug with swiftshader OpenGL libraries in Linux. - Multilanguage support added: now english, spanish and french are available. - Some corrections have been made on the original english texts. - Slight adjustments on the graphical interface. - Optimized loading and response speed when showing folders with lot of content, when moving the width of the columns, etc. - When interchanging tags position in an element now origin is inserted in desired position (not interchange as up to now). - Solved bug when moving panel width after resizing window. Other minor bugs fixed. Image over rest of elements when zooming. - Added tool to copy all tags of an element in other elements. - Improved speed on searching tasks. - Added check for updates. - Added option to create folder. Selected elements are maintained through the different viewmodes. - Optimized tag representation times. - Bug with last modified date solved. - Bug with visualization of deleted images solved. - Changing the viewmode or order in the browser no longer needs to reload directory. - When creating and deleting folders correct treeview update. - Added the tag copier tool to the search panel. - Improved folder content loading times.